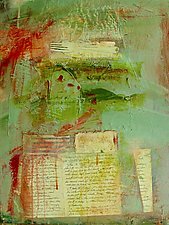 "My intention is to meld personally meaningful materials into earthy and elegant works. My intuitive process is inspired by music, dreams, and nature. " Using personal memorabilia, Maren Larson creates narrative collage and mixed media paintings. If an object appears in her paintings, it is not because she depicted it. They are real objects--a pants pocket, a family letter--that have been skillfully absorbed into the larger composition. 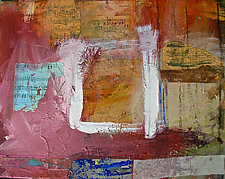 Exposing and burying previous layers, the resulting painting is an engaging, complex and expressive image. Larson works in a bright studio surrounded by woods, a creek, and her all perennials no-grass garden. The textures of the natural mantle provide a continual visual invitation. Each painting is a unique experiment composed of many layers that are inscribed, painted, scratched, scraped, torn, sewn, glued & glazed. 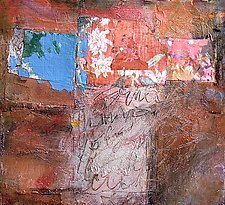 One of her favorite things is to discover accidental colors, textures and shapes that have formed on the reverse side of paper and fabric intentionally removed from the paintings. 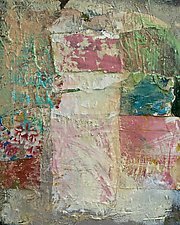 Larson is primarily self-taught, but developed her knowledge of painting and collage through Intensive Studies Seminar in Taos, New Mexico, and classes at Western Washington University in Bellingham, WA. She also took art classes for two summers at the University of Minnesota. She holds a BS in Elementary Education from the University of Minnesota and taught elementary school for 18 years.